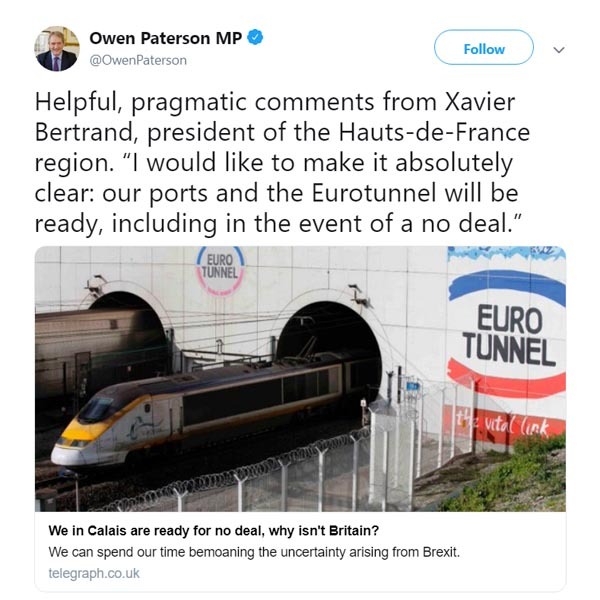 Not willing to leave the issue alone, the Telegraph recently ran an authored piece from Xavier Bertrand, president of the Hauts-de-France region of France, writing under the headline: "We in Calais are ready for no deal, but is Britain?". This is a local politician with a position to defend. He is fighting off intense competition from Belgian and Dutch ports, anxious to send a message that the port and the tunnel will be able to handle traffic in a post-Brexit scenario. Thus, he is obviously going to say that "we in Calais are ready". And he's not entirely lying. One way or another, they will be ready. The port and Eurotunnel will cobble together temporary facilities, with a gaggle of Portacabins and borrowed buildings, using half-trained officials and untried IT systems, all to provide some sort of service on the day. If, as has been suggested could happen, traffic falls to a mere 12 percent of previous levels, then they might just be able to cope without too many delays – as long as French fishermen or farmers don't intervene and blockade the port. Nevertheless, there's no way Calais could handle normal traffic, and Xavier Bertrand is the wrong man to ask anyway. He's a local politician and customs and veterinary checks are managed by central government, mandated by EU law. They are outside his control, so he's not in any position to give assurances, one way or another. But then, the Telegraph is no longer in the news business. It is a propaganda sheet with an agenda. It's the same agenda as Breitbart, which runs a similar story, based on Bertrand's comments to Sky News, where he made the same pitch. As for Sky, it's in the entertainment industry. There's not enough conviction in the entire operation for there to be an agenda. The reporters simply add to the noise, filling time in the same way that the papers fill space. Anything goes. Another one with an agenda, though, is Owen Paterson. As an MP, he is supposedly a representative of his constituents. In that role, he would serve his constituents best by finding out what was going on, and keeping them informed. But that's not Owen's game. The man who once declared that it would be "madness" to leave the market has since been seduced by the dark side, so he tweets Bertrand's comments as being "helpful" and "pragmatic". To date, that gets him 645 retweets and 1,324 "likes". In truth, Mr Paterson has no means of knowing whether Bertrand is right or not. In times past, he might have asked me – and in this case I would have told him to treat the claim with great caution. But, like the Telegraph, Owen is also in the propaganda business. Bertrand has said something helpful to his cause, so he gets tweeted. If the words had been unhelpful, there would have been silence. And that's the way it works these days. Whether something is true or false doesn't matter. Information is just a commodity, to be harnessed in service of the cause. Yet, for all that, it is hard to stop information flowing. The paywall-free Guardian, for instance, is conveying to us that the Cabinet Office is drawing a parallel between the volcanic eruptions in Iceland during 2010, when aviation in northern Europe was badly disrupted, and a no deal Brexit. The Cabinet Office, we are told, believes this represents the "nearest recent example" of what government departments could have to cope with, even if the potential disruption to the UK is likely to be much broader. We also get to learn that these comparisons, and the lack of detailed preparations at the heart of government, are causing immense disquiet among some rank-and-file civil servants. "The level of planning required for no-deal Brexit is the same level as war planning", a Whitehall source is cited as saying. "A no-deal Brexit will have the same systemic impact. Iceland gives us hints and clues about what might happen, but Brexit is unlike anything we have ever seen". Any serious evaluation of the potential consequences will confirm this, which emphasises the enormous disconnect between serious studies and the output of dilettantes such as James Delingpole, whose certainties are matched only by his profound ignorance of the subject. According to a civil service evaluation which the Guardian claims to have seen, a "reasonable worst-case scenario" includes a reduction in certain fresh foods and increases in prices, with people on low incomes disproportionately affected. Also expected, without any explanation as to why, are price rises across utilities and services including fuel, and diverse effects from private companies "cashing in" because they will put commercial considerations first. Police forces are expected to be "stretched" by the likelihood of protests and counter-protests, along with an increase in public disorder, restocking of medicines becomes problematic after the first six weeks and there is disruption of supplies to vets, which could "impact the UK's ability to prevent and control disease outbreaks" among animals. Another, well-rehearsed issue is the "significant reduction" in the flow of goods through Dover and Eurotunnel, to as low as 13 percent of current capacity on Brexit day. It is hard to see specifically how this translates into experiences which will impact on the lives of ordinary people. Expectations of public disorder are largely speculative and fears of food shortages may be ill-founded. As long as outward traffic (to the continent) is managed, there should be no reason why the flow of food imports should be interrupted. However, we do know – from previous experience – that shortages can be triggered by panic buying, with supermarkets stripped bare of certain commodities even when normal stocks are available. Much will depend on public sentiment in the immediate aftermath of Brexit, and the way issues are handled by the media. Within the civil service, concern is focused on the decision-making processes of the Cobra committee. While local authorities, agencies and health trusts have been making no-deal preparations, there is little understanding in Whitehall about what they have done, yet Cobra "can only take decisions if it knows what is going on at the local level". A source complains that it needs information that has been properly collected and collated but, at the moment, "we don't have that system in place". Others complain that they are "having meetings for the sake of having meetings" and that there has been no proper oversight of what is happening on the ground. Thus says another source, "In many areas we are flying blind. It's appalling and incredibly frustrating". He adds: "There has been a lack of energy and a lack of urgency. The preparations for no-deal Brexit feel very unstable". This cannot be helped by what Sir Ivan Rogers called in his recent speech "denialism". We have one strain of the narrative, expressing increasing concern at the potential consequences of a no-deal, while a substantial body of noisemakers argues that there will be no problems or, at worse, minor and temporary disruption. It is very difficult to determine exactly how the public is responding to the apparent contradiction, but I for one am not in the slightest bit reassured but boilerplate official statements, where we are told that: "The government remains committed to delivering an orderly withdrawal from the EU. Our high-level planning assumptions ensure we can responsibly prepare for all scenarios". The essential flaw here is that so much of the no-deal planning relies on actions taken by authorities in EU Member States, and by the EU institutions. And when we are getting bland, but unsubstantiated claims from the likes of Xavier Bertrand, there are no good grounds for confidence. Nevertheless, there is considerable resilience within UK public systems, and there has been extensive private sector planning, to deal with the possibility of supply chain disruptions arising from a no-deal Brexit – all of which might reduce the impact of temporary disruptions. In terms of crowd psychology, reaction is likely to be at its most severe if problems are unexpected and build rapidly, feeding a crisis mentality. Yet, there can hardly be anyone who is unaware of claims of logjams at Dover. In the event of nothing serious emerging, there is a distinct possibility that Brexit day could seen as a non-event, from the perspective of a public spectacle, with the real problems developing out of sight. On the other hand, we could experience a "slow burn", with low-level problems building to crisis proportions – weeks or even months down the line. But if there has been something that has not been factored in, it is the appalling deterioration in the quality of media coverage, and the erosion in trust in media sources. As long as the likes of the Telegraph and others treat news as a commodity, to be shaped according to need, public responses may be unpredictable when claims (and even official statements) are treated with suspicion or even disbelief. Playing fast and loose with the truth may be easy to do, but coming events may demonstrate that there are consequences. Trust is hard to build but easily squandered and, after Brexit, it may be the commodity that is in perilously short supply.